SUBHEAD: State secrets bill meant to suppress Fukushima news — Japan public stunned, citizens could face years in prison. Image above: Isn't that cute? An itty-bitty nuclear plant built so I can dance all night, in an ugly city called Funky Town, after a week working in a cubicle as a drone in the system. Still from first video below. Associated Press, Nov. 26, 2013: Japan’s more powerful lower house of Parliament approved a state secrecy bill late Tuesday [...] Critics say it might sway authorities to withhold more information about nuclear power plants [...] The move is welcomed by the United States [...] lawyer Hiroyasu Maki said the bill’s definition of secrets is so vague and broad that it could easily be expanded to include radiation data [...] Journalists who obtain information “inappropriately” or “wrongfully” can get up to five years in prison, prompting criticism that it would make officials more secretive and intimidate the media. Attempted leaks or inappropriate reporting, complicity or solicitation are also considered illegal. [...] Japan’s proposed law also designates the prime minister as a third-party overseer. Video above: So damn cute! Older Areva, ad promoting nuclear energy. From (http://youtu.be/GgZsamFWyBI). 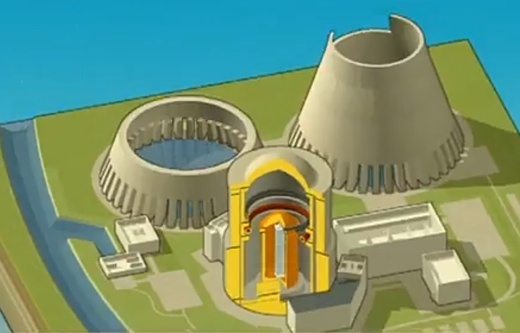 Video above: Animation of Areva advanced nuclear power plant design. From (http://www.youtube.com/watch?v=mPi2kT_RbCI). Video above: Recent Areva ad promoting nuclear power with a history of industrial energy production. From(http://vimeo.com/18426643).